Everyone's talking about this little cosy eatery, and we say, the buzz is all worth it! Chez Moi, a mushy and romantic restaurant recently opened up at Reclamation, right next to Candies and Quench. As soon as we stepped inside, the charming traditional French decor casted a spell on us and we were already in love! One of the servers promptly guided us to a table and presented us with the menu, which was unusually placed inside a magazine cover. Going through the menu we noticed the y had limited options for soups, salads, starters, sandwiches, pastas, pizzas, mains and mocktails. To start with, we called for the Lemon Grass Mojito and the BBQ Chicken Supreme. The mojito was an impeccable blend of sweet and sour. The BBQ Chicken Supreme was a platter of tender chicken pieces marinated in barbeque sauce, delicious and perfectly cooked. For the mains, we opted for the Pepper Chilly Mushroom Pizza with Chicken (extra topping). It was slightly bland and could have been a little more flavourful, but nevertheless, it was crisp and cheesy! We must say that this place is a must try for all foodies and we noticed that it wasn’t as expensive as it’s perceived to be. A special shout out to the outstanding service that went a step ahead in making sure their customers were enjoying their meal. 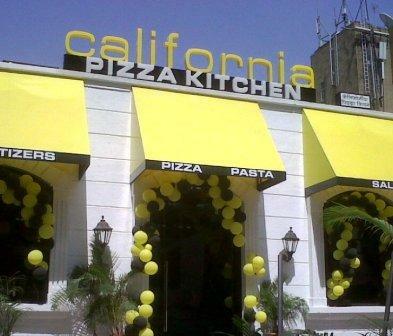 Guest blogger Diti Shah shares her review of the newly opened CPK @ Phoenix Mills. The entrance, with sunny yellow awnings reading “pizza, pasta, appetizers” would lure any Phoenix shopper to step in. I sure fell for it! The restaurant is spacious and bright, with neat brown tables, a swanky bar area and a tall wine rack to complete the look. Although it is only two days old, CPK is already pulling crowds, the reason being its brand name... or perhaps the aroma of fresh bakes. CPK’s menu is more or less the same across all outlets; it includes appetizers, pizzas, pastas, soups, focaccia sandwiches, salads and desserts (a complete medley of Middle-Eastern, Mexican and Italian cuisines). Well, as long as it’s yummy! Try Hummus with Pita Bread; or Lettuce Wraps, or the Baja Chicken - a famous appetizer of grilled chicken breast loaded with cheese, corn, black beans, red onions and cilantro and served with fresh guacamole. But if you’re not a big eater, skip the appetizers and jump straight to the mains. The “Specialities” menu has a dish called Chicken Milanese, which MasterChef lovers would not want to miss! Anyway, I was craving for pizza. Unfortunately you can’t make-your-own pizza so I had to pick one from the menu. The Goat Cheese pizza sounded tempting, yet too cheesy. The Thai pizza sounded bizarre, thai curry and pizza? No way! The Greek Pizza has awesome toppings but they’re served cold. Okay, next! The Pesto Pizza with kalamata olives sounded awesome but I finally called for a Veggie Aubergine thin-crust pizza. 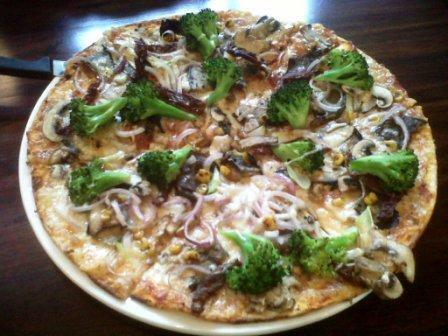 Topped with fresh broccoli, mushroom slivers, sweet corn, red onions, sundried tomatoes and aubergine, it was flavourful but not divine. (Priced at Rs.380+taxes, add chicken at an extra cost). The Chocolate Brownie with ice-cream and hot chocolate sauce was a much sweeter deal.